Syrian President Bashar al-Assad has spoken out for the first time about Europe’s refugee crisis. In an interview with Russian media, he blamed Western support for what he called ‘terrorists’ for the exodus from Syria amid his country’s civil war. And he accused Europe of inconsistency. “How can you feel sad at a child’s death in the sea and not feel for the thousands of children who have been killed by the terrorists in Syria? And also for the elderly, for the woman and men? These European double standards are no longer acceptable,” Assad said. More than 240,000 people have died in four years of conflict between insurgents and Syria’s government which describes all armed groups fighting it as terrorists. The insurgents in Syria range from the hardline group calling itself Islamic State to nationalists viewed as moderate by the West. “The West is supporting terrorists since the beginning of this crisis when it said it was ‘a peaceful uprising’ – as they called it . Countries including the US, Turkey and Saudi Arabia want to see Assad leave power and have supported opposition to his rule, including some of the armed groups fighting him. Assad said Turkish support had been crucial to the growth of two of the biggest insurgent groups in Syria, ISIS and the al Qaeda-linked Nusra Front, and that aerial bombing by a US-led coalition has failed to stop ISIS. Turkey denies the accusation. Assad has been buoyed in recent weeks by signs of increased military support from his ally Russia. In his comments he made no mention of reports of Russian military activity in Syria and said there was no coordination between his government and the United States, even indirectly. 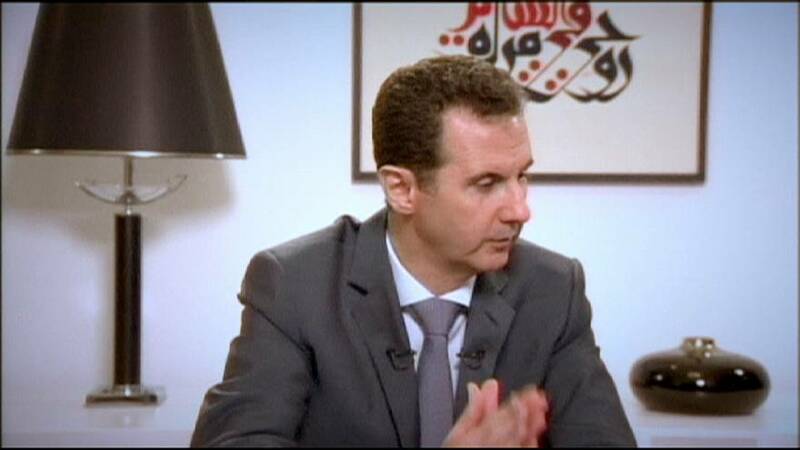 Assad also played down proposals for a peace initiative that ally Iran has said it presented to Syrian officials.